Hello LoCo followers! My name is Michael Busch; I am currently a sophomore at Arizona State University majoring in Astrophysics and Computational Mathematical Sciences. I started working in the Low-Frequency Cosmology (LoCo) Lab in August of 2013 under both Dr. Judd Bowman and (more directly) Dr. Danny Jacobs. The LoCo lab is involved with some awesome radio research, as Nithya described last post. This semester, I am helping Danny identify sources of noise in the power spectrum of the Murchison Widefield Array (MWA). One of my other regular duties in the lab is aiding in the lab’s education and public outreach department. LoCo participates at a majority of the events hosted by the School of Earth and Space Exploration, including Earth and Space Open Houses and other special events, such as Earth and Space Day and Night of the Open Door. Night of the Open Door occurred in March, this is the biggest public education and outreach event that Arizona State hosts. All of the colleges and schools in the University host their own events and open their doors to the public for them to see some of the cool research that lab groups and departments are conducting. Planning for this event had been ongoing for many months, and many different groups in the School of Earth and Space Exploration (SESE) participated. 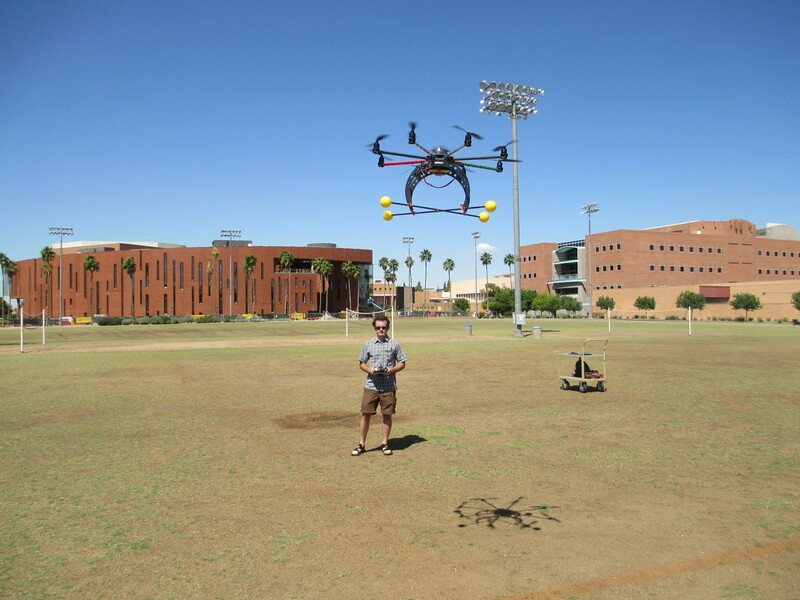 As with many events well-planned and organized—catastrophic weather struck and monsoons doused the ASU Tempe campus. This was, overall, quite unlucky for the outdoor demonstrations across campus, but dramatically increased the influx of visitors to our building. 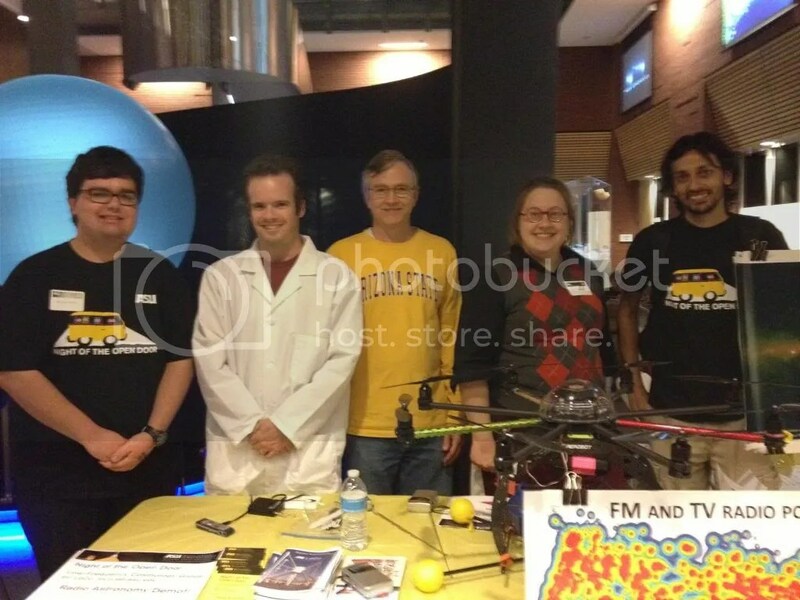 LoCo had two tables full of demos and information for the public: including one of the dipole antennas used in the MWA, the Octocopter autonomous flying drone, Radio Frequency Interference (RFI) detectives, a giant word search puzzle, and a poster that I made explaining some of the general science behind the MWA. Despite the weather, Night of the Open Door yielded an amazing turnout, and the LoCo table was quite the hit! The LoCo lab at Night of the Open Door, with the Octocopter on display. From left to right, Michael, Danny, Tom, Jackie, and Nithya. My name is Nithyanandan Thyagarajan. I joined the LoCo (Low frequency Cosmology) lab group at ASU SESE headed by Prof. Judd Bowman, in September 2013 as a postdoctoral research scholar. I did my bachelor’s in Electrical Engineering from IIT Madras, India. 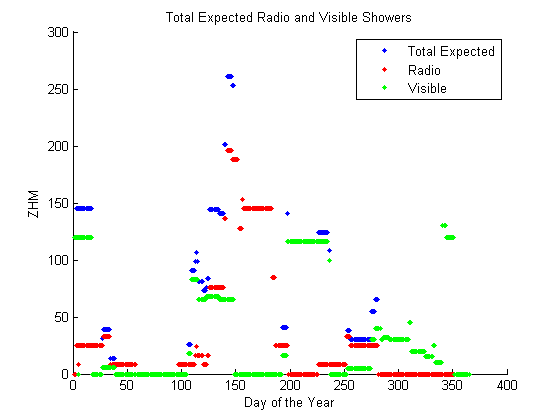 For my PhD thesis at Columbia University, I worked on identifying and characterizing variable and transient radio objects by conducting one of the biggest searches of its kind in the radio sky. I then moved to Raman Research Institute in Bangalore, India as a postdoc and worked on statistical characterization of foreground contamination in the power spectrum of redshifted 21 cm line emission of neutral hydrogen during the epoch of reionization (EoR). During this period I got associated with the Murchison Widefield Array (MWA) project. The LoCo group has members involved in a variety of interesting projects. 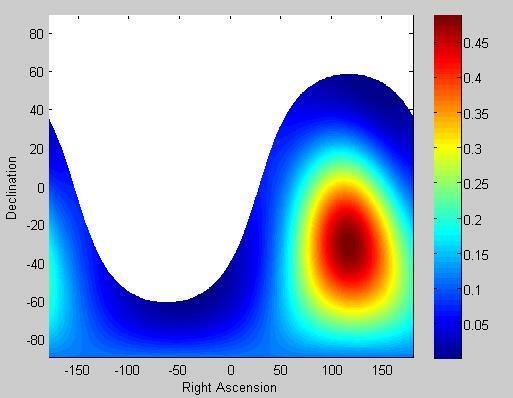 Besides having a strong presence in the MWA project, the members are also involved in other EoR experiments using the Experiment to Detect the Global EoR Step (EDGES), Precision Array for Probing the Epoch of Reionization (PAPER), Dark Ages Radio Explorer (DARE), Long Wavelength Array (LWA) and other theoretical and modeling projects. I am excited to be a part of this diverse group which provides enormous opportunities to learn science through the many perspectives from these different experiments. 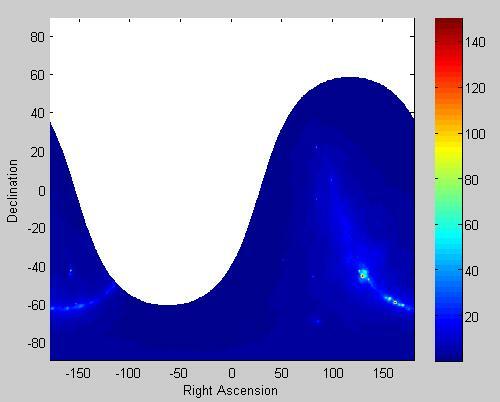 Currently, I am focusing on setting up simulations to predict the response of the MWA telescopes to all-sky radio emission. My aim is to isolate and characterize the signatures of different spatial structures of foreground objects such as the Milky Way, and other extragalactic objects besides the instrument’s own systematic effects on the observed power spectrum that contains information about the spatial distribution of redshifted 21 cm line emission from neutral hydrogen from the EoR. An understanding of the radio foreground objects and that of the telescope is extremely significant because the expected signatures from the neutral hydrogen emission during the EoR are extremely faint compared to the contamination from radio foregrounds and instrumental artifacts. Detecting EoR signal may be impossible without a precise removal of such contamination and artifacts. 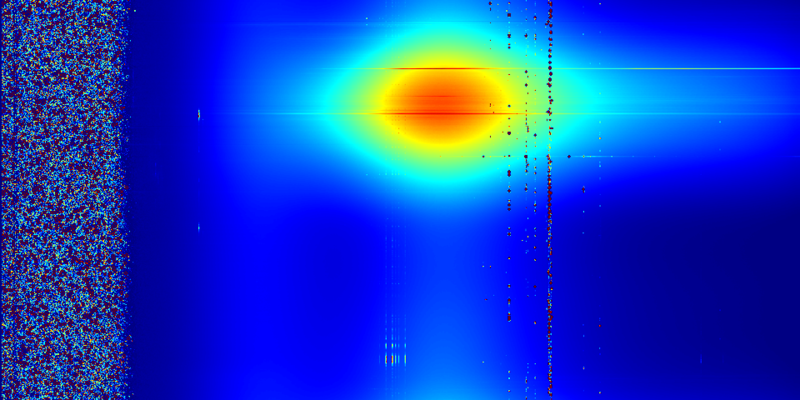 Here’s an approximate simulation of the radio foreground and instrumental signatures we expect to see in the power spectrum when the entire hemisphere of the sky is observed by the MWA telescope. The simulations are found to match well with results from analysis of data from the MWA telescopes. Predicted spatial power spectra of an all-sky radio model of foreground objects as seen by MWA telescopes. 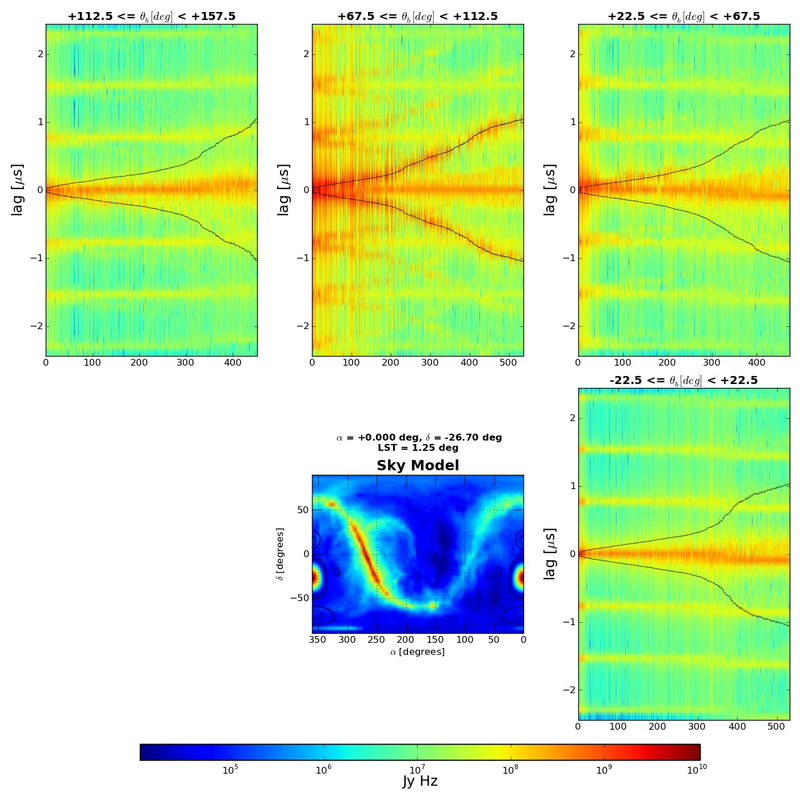 The all-sky radio emission model is shown in the central panel. 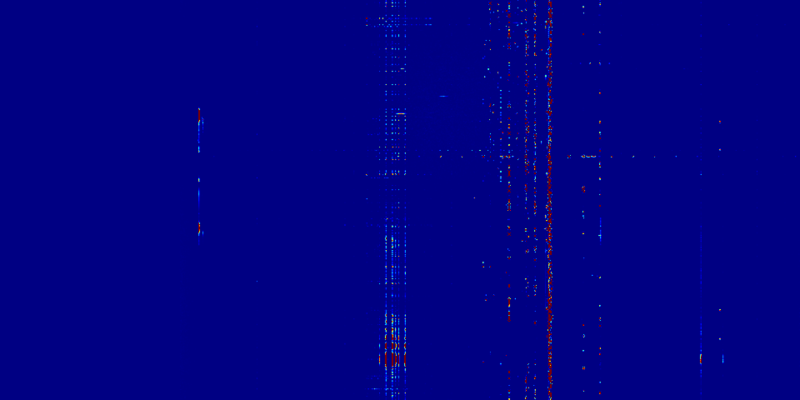 The peripheral panels show the power spectra recorded by different antenna pairs (x-axis) grouped by orientation of the lines joining them (EW at bottom right, NE at top right, NS at top center, and NW at top left). The x-axes in all the peripheral panels represent the different antenna pairs which sample the transverse spatial information from emission from the plane of the sky while the y-axes sample spatial structures into the plane of the sky. 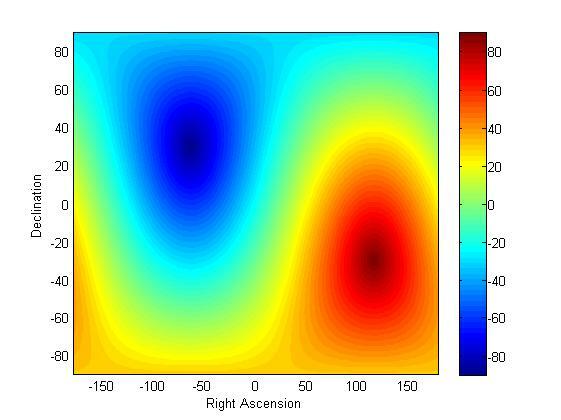 Since the sky model contains heterogeneous spatial structures, these different antenna pairs record different spatial information. The wedge/fork shaped feature prominent in the top center panel and the bright horizontal feature in all the peripheral panels arise out of the emission from our galaxy and other extragalactic radio emission (all the bright features enclosed by the forked black lines). The periodically repeated horizontal structures are caused by the frequency characteristics of the MWA telescopes. Science experiments, as in life, are plagued by uncertainties. As sarah showed last week, a particularly pernicious one is the response of the telescope across the image. Things tend to get dimmer towards the edges, but without some very well known source in that area, its difficult to correct. Most telescopes get around this problem by physically scanning across a known source, tracing out the response function. Our new low frequency telescopes (MWA,PAPER) are fixed to the ground, we do not have the option of moving the telescope. So its time to get creative. We can use satellites, known astronomical radio sources, or we can even fly a known transmitter over the telescope. So, I hope this explains this picture here. Danny flying the Octocopter. Next, we’ll be attaching a calibration antenna. Is it Abstract Art or Science? Many cosmological questions about the early universe are on the horizon of scientific discovery at this time. Theorists have come up with a time line that shows the development from the Big Bang to the present gigantic and complex universe. Can we prove what the theorists have predicted? Perhaps – but with every measurement there is some amount of error and uncertainty. Unfortunately, the uncertainty that can be tolerated in our group’s experiments to be able to state definitively, “We know when the first stars and black holes formed” is ridiculously small. 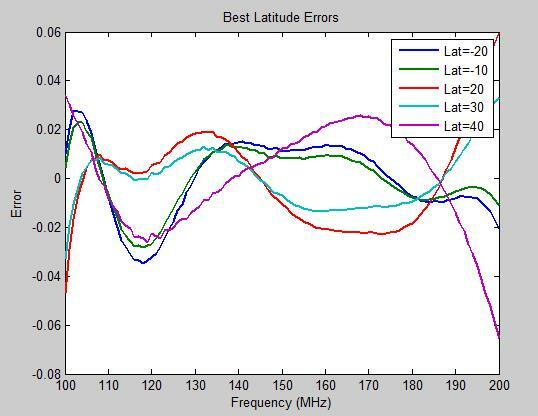 The project that I have been working on for the last year set out to find the error related with using an antenna at varying locations on the Earth and different times during the day to make accurate measurement of the radio spectrum. Every antenna has a beam pattern – which is the area that an antenna can collect information from, and each beam pattern has places that are more sensitive and less sensitive to incoming signals. By projecting these beam patterns onto a temperature coded map of the sky, an estimate of what that antenna can “see” at that time, frequency, and location on the globe can be made – but if you ask me, most of the information I get resembles a painting I would love to hang on my wall. 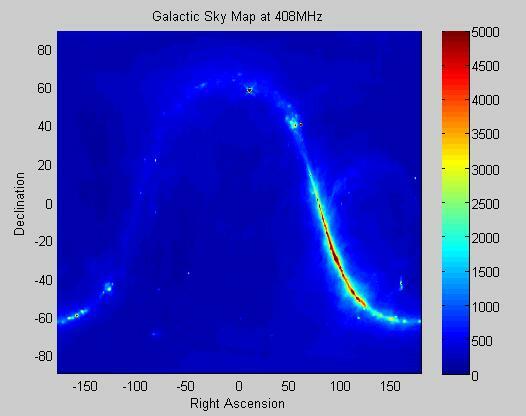 Figure 1 shows the temperature coded map of radio emission from our own Milky Galaxy in the sky – red is hot and blue is cold. 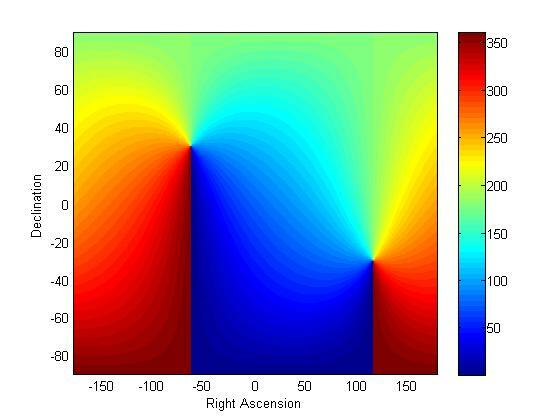 Figures 2 and 3 above show how the modeled beam pattern looks for a physical antenna in two different astronomical coordinate systems. 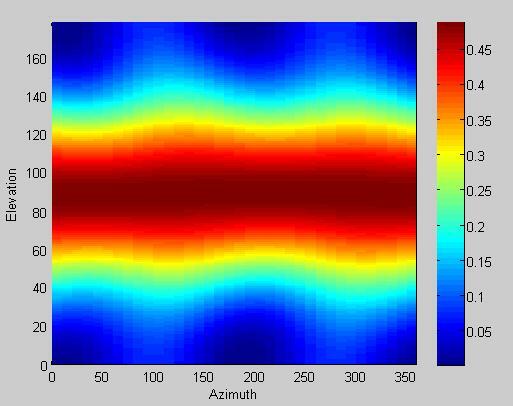 Figure 4 filters the beam pattern, modeled on the data set generated for the antenna beam pattern filtered by RA/DEC, against the sky map. On the color scale, red is the strongest signal and blue is the weakest signal. So as the earth rotates, the sky over the antenna will change and the red, or strongest collecting point, will hit different parts of the sky. In Figure 4, the beam pattern was projected on the galactic sky map at an arbitrary latitude, longitude, and time on earth (in this case a location in Australia). After this projection, the temperature of the projected map was summed at each frequency. Once this was coded, I add a series of “for” loops in my software to change the antenna’s latitude from -90˚ to 90˚, the time from hour 0 to 24, and the orientation azimuth from phi of 0˚ to 360˚. After plotting as a function of frequency, the curves were fitted with a second order power curve with the form: Ax^B+C. All of the curves and the corresponding residuals were plotted on the same figure for better comparison (Figure 5 and Figure 6 below). Once on the same plot, the curves that had an error larger than 0.05 K were eliminated. 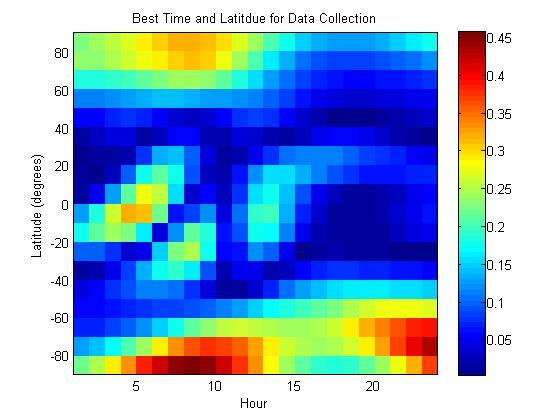 The last step was changing the time and the location simultaneously to determine the best combination of data collection of those two parameters – this can be seen in Figure 7. So far, our experiment site in Western Australia at -27 latitude is looking pretty good (at least for part each day)! This process, although easy to write out step by step, was quite particular. 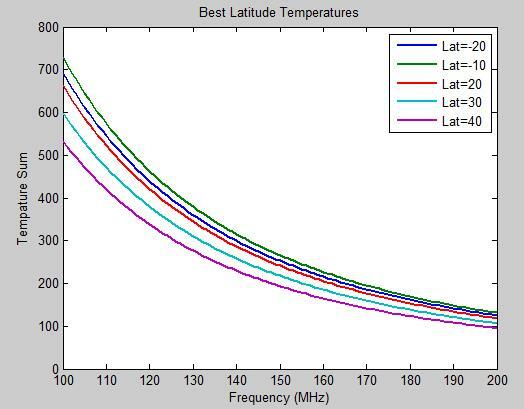 Taking hundreds upon hundreds of data points from an antenna and figuring out how to adapt the program that was written for the theoretical case was less than straight forward. So, is it abstract art or science?? Plot of the Coordinates – This one is fun to look at! Another plot of the coordinate system that is just fun to look at! How could a fermented milk product riddled with holes relate to the cold space filled with hydrogen gas and stars, and to a branch of mathematics that no one understands? The answer depends on how you look at the Universe. Regular readers may know that our colleagues in the Low-frequency Cosmology (LoCo) group here at ASU are building instruments to observe 21 cm spectrum of hydrogen from the early Universe. In a non-scientific description, we are trying to look at “rainbows” emitted by hydrogen gas using radio telescopes. The “rainbows” from different periods of time in the Universe also happen to fall into different frequencies of radio signal. Observing them at various radio frequencies will let us construct a cube showing the distribution of hydrogen in the early universe as a function of time. Now, emission from stars and galaxies breaks up hydrogen atoms surrounding them into nuclei and electrons, creating “bubbles” in which hydrogen gas is ionized, and there will be no 21 cm spectrum from within the “bubbles.” As a result you will see holes in the cube, like a block of Swiss cheese! I should also point out that the size of these “bubbles” can tell you what the stars that produce them look like! Unfortunately, our current generation of instruments is not good enough to construct a clean data cube that will let us directly look at the “bubbles” and measure them, and we will have to learn from statistics. Think about it this way: You count all the holes with a particular size or volume in your block of Swiss cheese. Then you chop up the cheese into pieces to “contaminate” them (be careful not to cut through the holes too much), then mix in small pieces of another type of cheese with tiny holes, like Tilsit, and randomly put all the pieces back into a block. If you then count the holes and measure their sizes again, the number should be relatively the same. (Remember that holes in Swiss cheese are big!) This analogy does not exactly describe what we will be seeing in our data, but it roughly explains what I meant by statistics. The bottom line is that you can still learn something about the Universe from bad data by using statistics. Figuring our what type of statistics to use and the best way to use them on the 21 cm data will be my Ph.D. thesis. Please cheer and support me! Piyanat Kittiwisit, or Boom (as he likes to be called), is a graduate student in the Low-frequency Cosmology group in the School of Earth and Space Exploration at ASU.